Were the two Rikers two different people or duplicates of one person? If they were true duplicates, did they subsequently become two different persons the moment they started leading separate lives and forming new memories and identities? This is the essence of the identity problem and it is vital to solve for all resurrection scenarios, both religious and scientific. The identity problem was first articulated by the ancient Greek scholar Plutarch in his thought experiment known as the “ship of Theseus.” According to the myth, Poseidon’s son Theseus sailed to Crete where he slayed the half-man/half-bull Minotaur monster. After his triumphant return to Athens, Theseus’ ship was preserved in memoriam. As the vessel aged, however, the decaying wood was gradually replaced with new timber until eventually the entire ship was made of different material. Was it still Theseus’s ship? The answer depends on how you define the true identity of a thing—as the pattern or the material.2 If Theseus’s ship is represented by the pattern, then replacing all its lumber does not alter its identity. If the ship’s distinctiveness is held in the material of which it is made, however, or in some combination of pattern and material, then altering the physical structure changes the identity in some manner. But how much would need to exchanged before it was no longer the same “thing,” no longer Theseus’s ship? Take our bodies. In addition to the replacement of atoms, molecules, cells, tissues, and organs every few years, there are a huge number of “foreign” cells inside us that contain no human DNA or RNA—bacteria that produce chemicals that enable our bodies to process the energy and nutrients in the food we eat, others that boost immunity, and still others whose function remains mysterious.3 More identity-shattering still, it appears that the complex eukaryotic cells of which we are made evolved billions of years ago from much simpler prokaryotic cells in a process the evolutionary biologist Lynn Margulis calls symbiogenesis—the cooperative union of primitive simple prokaryotic cells into modern complex eukaryotic cells.4 The membrane-bound mitochondria organelles inside our cells that are so vital to the processing of energy, for example, have their own DNA different from that found in the nucleus of the cell (the famous mitochondrial DNA from which our genetic heritage can be traced over millions of years). It is now commonly believed that around 1.5 billion years ago some of these free-living bacteria (prokaryotes) symbiotically cooperated to form the more complex eukaryotic cells that make up modern organisms like us. So if you go back far enough in evolutionary time even our cells are foreign. And yet we don’t feel like a collection of other organisms. We feel like a whole self. The pattern of biological information coded in our genome, and the neural synaptic arrays recorded in our brain’s connectome, assures this continuity of essence. You are still you across space and time, even though the material making you up changes. Our sense of identity remains intact despite the exchange of body stuff, so our uniqueness appears to be ingrained in the pattern more than the material. By this analysis, would a duplicate of you also be you, even if it meant that there is more than one of you? In principle, yes, as long as each of the duplicates feels like an autonomous person. This is why, in addition to the pattern and the material of identity, there is an additional component: personal perspective. Every self-contained sentient being—by which I mean the capacity to be emotive, perceptive, sensitive, responsive, and conscious—has a personal perspective, and that is what makes each person an autonomous identity. By this definition, in the Star Trek scenario each Riker has his own personal perspective so each is his own person, in the same way that identical twins are two persons, both psychologically and legally. The moment you and your duplicate (or identical twin) begin to lead separate lives you are separate persons, not just because of the different perspectives but also because of the different experiences you have, forming distinct memories, personalities, and all the rest that goes into the make-up of your pattern of information. The Soul. William Blake’s portrayal of the soul departing the body upon death captures what most people believe to take place. 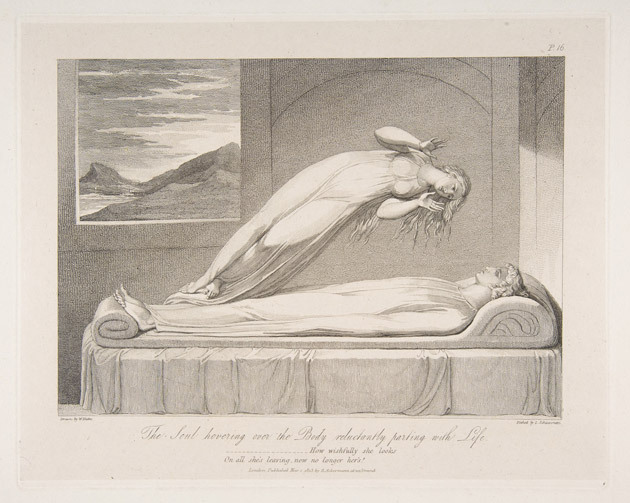 An illustration from a series designed by Blake for an edition of the poem “The Grave” by Robert Blair, engraved by Louis Schiavonetti in 1813, titled The Soul Hovering over the Body, Reluctantly Parting with Life. Courtesy of the Metropolitan Museum of Art. The neurobiologist and philosopher Owen Flanagan summarizes the three primary characteristics of the soul:5 the Unity of Experience (a sense of self or “I”), Personal Identity (the feeling of being the same person over the course of a lifetime), and Personal Immortality (the survival of death). Polls consistently show that between 70 and 96 percent of Americans believe in a soul as so characterized.6 The vast majority of people base such belief on religious faith, but science tells us that all three of these characteristics are illusions. Personal Identity. Scientists estimate that in the course of your lifetime most of the atoms in your body will be replaced by comparable atoms—hydrogen atoms most rapidly (given that our bodies consist of 72 percent water, which is two parts hydrogen and one part oxygen), then heavier elements such as carbon, sodium, and potassium.9 As atoms are replaced so too are molecules, cells, tissues, and organs, by some estimates on average every 7 to 10 years. There is a wide variation of the replacement process time, from a few days for the epithelial cells that line the gut, to a few weeks for the epidermis skin layer, to two months for red blood cells, to a year or two for liver cells, and 10 to 15 years for bone and muscle (exceptions appear to be neurons in the cerebral cortex, the inner lens cells of the eye, and heart muscle cells).10 So the belief that you are the same material person you were years ago—or will be years from now—is an illusion. At most what stays the same is the pattern of information, and even this changes over time. Personal Immortality. We have already seen that there is no evidence for an afterlife as proposed by religionists, but what about a scientific immortality? The thought experiments above demonstrate that duplication is not an option for immortality unless there is a continuity of self from one duplicate to the next. When you fall asleep or go under general anesthesia for surgery, despite the disruption in consciousness of several hours you still feel like yourself when you wake up. How, exactly, would that happen if you were duplicated, replicated, resurrected, or uploaded? If a brain could be cryopreserved and reawakened after, say, a thousand years, would it be the same as waking up from a long sleep? Maybe. What about a brain whose connectome of information is precisely recorded and uploaded into a computer? When it is turned on would the personal perspective of the person be in there? Maybe not. The Empyrean of God. Dante Alighieri’s 1320 poem “The Divine Comedy” is an imaginative vision of the afterlife inspired by medieval Christian theologians. 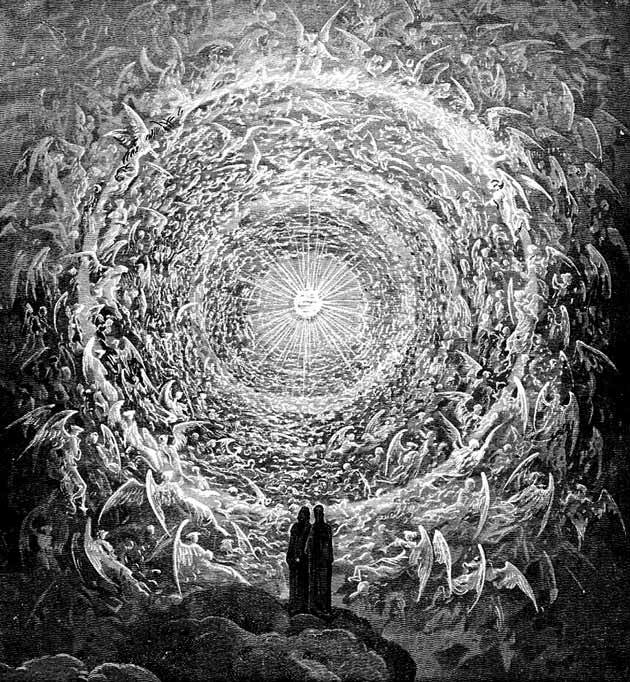 The artist Gustave Doré illustrated God’s empyrean for an 1892 edition of the work. The identity problem confronts both religious and nonreligious seekers of immortality. If you are religious and believe in the resurrection of the body or the soul in heaven, for example, how does God go about the duplication or transformation process to insure conscious continuity and personal perspective? Is it your atoms and patterns that are resurrected, or just the patterns? If both, and you are physically resurrected, does God reconstitute your body so it is no longer subject to disease and aging? If it is just the patterns of you that are resurrected, what is the platform that holds the information? Is there something in heaven that is the equivalent to a computer hard drive or the cloud? Is there some sort of heavenly quantum field that retains your thoughts and memories? If you are not religious (or even if you are) and hold out hope that one day scientists will be able to clone your body and duplicate your brain, or upload your mind into a computer, or create a virtual reality in which you come alive again, we face the same technological problems as God would of how this is to be done. So our self is defined by our pattern of information as much as it is by the stuff of which we are made, and it is our personal perspective and our unique experiences that makes us autonomous selves regardless of how similar or dissimilar we are from others. This is the real you. This is your soul. The sums involved in achieving immortality through the duplication or resurrection scenarios are not to be underestimated. There are around 85 billion neurons in a human brain, each with about a thousand synaptic links, for a total of 100 trillion connections to be accurately preserved and replicated. This is a staggering level of complexity made all the more so by the additional glial cells in the brain, which provide support and insulation for neurons and can change the actions of firing neurons, so these cells better be preserved as well in any duplication or resurrection scenario, just in case.11 Estimates of the ratio of glial cells to neurons in a brain vary from 1:1 to 10:1. If you’re not a lightning calculator, that computes to a total brain cell count of somewhere between 170 billion and 850 billion. Then factor in the hundreds or thousands of synaptic connections between each of the 85 billion neurons, adding approximately 100 trillion synaptic connections total for each brain. That’s not all. There are around ten billion proteins per neuron, which effect how memories are stored, plus the countless extracellular molecules in between those tens of billions of brain cells. These estimates are just for the brain and do not even include the rest of the nervous system outside of the skull—what neuroscientists call the “embodied brain” or the “extended mind” and which many philosophers of mind believe is necessary for normal cognition. So you might want to have this extended mind resurrected or uploaded along with your mind. After all, you are not just your internal thoughts and emotions disconnected from your body. Many of your thoughts and emotions are intimately entwined with how your body interacts with its environment, so any preserved connectome, to be fully operational as recreating the experience of what it is like to be a sentient being, would also need to be housed in a body. So we would need a warehouse of brainless clones or very sophisticated robots prepared to have these uploaded mind neural units installed. How many? Well, to avoid the charge of elitism, it’s only fair that everyone who ever lived be resurrected, so that means multiplying the staggering data package for one person by 108 billion. Then there’s the relationship between memory and life history. Our memory is not like a videotape that can be played back on the viewing screen of our minds. When an event happens to us, a selective impression of it is made on the brain through the senses. As that sense impression wends its way through different neural networks, where it ends up depends on what type of memory it is. As a memory is processed and prepared for long-term storage we rehearse it and in the process it is changed. This editing process depends on previous memories, subsequent events and memories, and emotions. This process recurs trillions of times in the course of a lifetime, to the point where we have to wonder if we have memories of actual events, or memories of the memories of those events, or even memories of memories of memories…. What’s the “true” memory? There is no such thing. Our memories are the product of trillions of synaptic neuronal connections that are constantly being edited, redacted, reinforced, and extinguished, such that a resurrection of a human with memories intact will depend on when in the individual’s life history the replication or resurrection is implemented. Most of our memories are lost over time, so when God, Omega, the Singularity, or far future Humans (GOSH) reconstructs the pattern of your memories, which ones actually represent you? The answer is none, some, and all. There is no coherently fixed individual in some absolute sense. Our self—our soul—consists of a constantly changing matrix of traits and memory patterns that are coherent enough for us to feel like we have a self/soul, and for others to treat us like we do, so a replicating entity must determine which set of patterns best represents our self/soul such that it would be recognizable to yourself and others. If GOSH resurrects you, for example, which of your memories will be included and from which point in your life? If it is a select set of memories at some point, say age 29, that’s not all of you. If it is all of the memories you formed throughout your entire life, that might be interesting (and revealing!) but this would not be what it is like to be you at any point in your life. Finally, there is the problem of history and the lost past. I have defined history as “a conjuncture of events compelling a certain course of action by constraining prior events.” Most of those constraining prior events—contingencies and necessities, or chance and law—are not only lost to historians, they aren’t even apparent to those alive at the time. The problem of the irrecoverable past of both people and society is a serious one that any theory of immortality must solve. Even if GOSH could create a perfect replica of my genome and connectome, a human life is so much more than that. It is a product of all our relations with other people and their life histories, plus our interactions with all the elements in our environment, which is itself a product of countless systems and histories all wrapped up in a complex matrix with so many variables that it is inconceivable how any supercomputer or omnipotent deity could duplicate it all even if the information were available, which it isn’t. In his book The Physics of Immortality the physicist Frank Tipler calculates that an Omega Point computer in the far future will contain 10 to the power of 10 to the power of 123 bits (a 1 followed by 10123 zeros), powerful enough, he says, to resurrect everyone who ever lived.13 That may be—it is a staggeringly large number—but is even an Omega Point computer powerful enough to reconstruct all of the historical contingencies and necessities in which a person lived, such as the weather, climate, geography, economic cycles, recessions and depressions, social trends, religious movements, wars, political revolutions, paradigm shifts, ideological revolutions, and the like, on top of duplicating our genome and connectome? It seems unlikely, but if so GOSH would also need to duplicate all of the individual conjunctures and interactions between that person and all other persons as they intersect with and influence each other in each of those lifetimes. Then multiply all that by the 108 billion people who ever lived or are currently living. Whatever the number, it would have to be even larger than the famed Googolplex (10 to the power of a googol, with a googol being 10100, or 10^10100) from which Google and its Googleplex headquarters derived its name.14 Even a googol of googolplexes would not suffice. In essence, it would require the resurrection of the entire universe and its many billions of years of history. Inconceivable. Chisholm, Roderick M. 2004. Person and Object: A Metaphysical Study. Routledge, 89. Margulis, Lynn. 1998. Symbiotic Planet: A New Look at Evolution. New York: Basic Books; Margulis, Lynn. 2011. ‘Symbiogenesis. A new principle of evolution rediscovery of Boris Mikhaylovich Kozo-Polyansky (1890–1957).” Paleontological Journal 44 (12): 1525–1539. Flanagan, Owen. 2002. The Problem of the Soul: Two Visions of Mind and How to Reconcile Them by Owen Flanagan. New York: Basic Books. Kurzban, Robert. 2012. Why Everyone (Else) Is a Hypocrite. Princeton University Press. Research in cognitive psychology also supports this proposition, elegantly summarized by the cognitive psychologist Bruce Hood in The Self Illusion, employing an analogy with a science fiction film: “We process the outside world through our nervous system in order to create a model of reality in our brains. And, just like the matrix in the science fiction movie, not everything is what it seems. We all know the power of visual illusions to trick the mind into perceiving things incorrectly, but the most powerful illusion is the sense that we exist inside our heads as an integrated, coherent individual or self.” Hood, Bruce. 2012. The Self Illusion: How the Social Brain Creates Identity. Oxford: Oxford University Press, 3. Shermer, Michael. 1995. Exorcising Laplace’s Demon: Chaos and Antichaos, History and Metahistory. History and Theory 34, no. 1:59–83. Tipler, Frank J. 1994. The Physics of Immortality: Modern Cosmology, God, and the Resurrection of the Dead. New York: Doubleday. The difference in the spelling—googolplex and googleplex—is because, says Google co-founder Larry Page, they didn’t yet have spell check when they named the company. In 1984, a migrant worker named Maria was being treated in hospital in Seattle for a heart attack when she suffered another cardiac arrest. After being resuscitated she reported that she had floated out of her body up to the ceiling, from where she could observe medical personnel working on her. Most remarkably, she says, she then journeyed outside the hospital room, where she saw a tennis shoe on the ledge of a third-floor window. A Gallup poll in 1982 reported that 5 per cent of adult Americans have experienced a near-death experience (NDE). And a slew of best­selling books in recent years lays out what those who have NDEs believe they are proof of, and where they went during their trip–notably Proof of Heaven: A Neurosurgeon’s Journey into the Afterlife by Eben Alexander. Do NDEs represent proof of an afterlife? We have only the word of Maria and her social worker that her incident happened at all. The journalist Gideon Lichfield noted when he tried to chase down the story for an article in The Atlantic that it was “thin on the evidential side”. Near-death experiences on the operating table can be hugely powerful. But are they really a foretaste of the hereafter – or just a neurological blip? Any explanation for the NDE must begin with the fact that the people who experience them are not actually dead. They are approaching their potential end, however–a state in which the brain may undergo stress, be deprived of oxygen, release neurochemicals that can mimic the hallucinatory trips of drug users, or experience any one of the dozens of neurological anomalies, abnormalities or disorders that have been documented by neurologists and neuroscientists. Many of NDE accounts are indistinguishable from those of people who have had drug-induced hallucinatory trips. Take Eben Alexander’s story of his “trip” to the afterlife during a meningitis-induced coma. There he met a beautiful young woman and together they travelled on the wing of a butterfly: “In fact, millions of butterflies were all around us… It was a river of life and colour.” Alexander was overwhelmed with a feeling of love, not friendship or romantic but “somehow beyond all these, beyond all the different compartments of love we have down here on Earth. Compare Eben Alexander’s trip with the “trip” taken by the neuroscientist Sam Harris after he and a friend ingested a dose of the drug MDMA, which he details in his book, Waking Up. Harris reports that he was overwhelmed with love for his friend. More than this, Harris says, “came the insight that irrevocably transformed my sense of how good human life could be… I suddenly realised that if a stranger had walked through the door, he or she would have been fully included in this love”. This is an edited extract from Heavens on Earth: The Scientific Search for the Afterlife, Immortality and Utopia, by Michael Shermer. It appeared on inews.co.uk on February 13, 2018.